I'm the creator of a book called Faeries of the Faultlines. This book was funded through Kickstarter and marked the beginning of a big adventure. 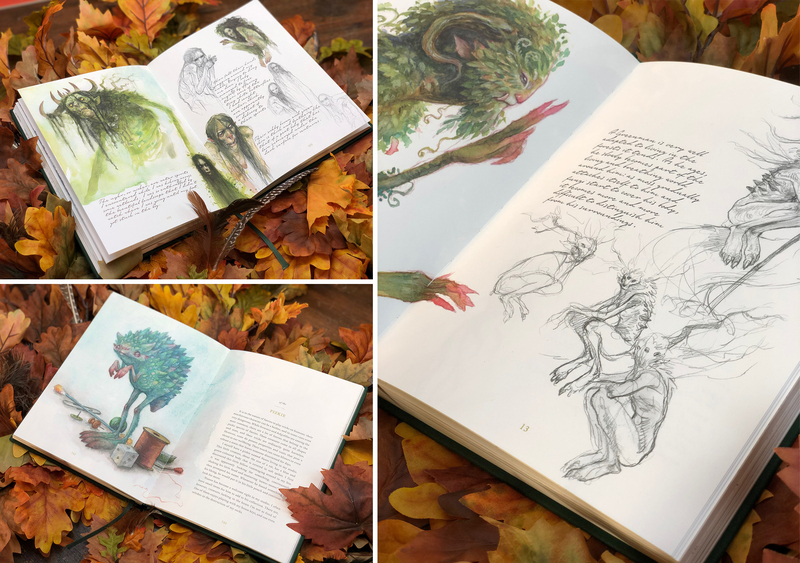 Ever since I was 7 and picked up Faeries by Alan Lee and Brian Froud, he actually wrote the intro to my book, I was fascinated with this Other world. And now I was going to add my voice to these stories. What began with daily sketches for #mermay and #junefae in 2016 opened up a world I started calling the Faultlines. This Patreon page is giving me the opportunity to dive deeper into this world, to bring you the stories and show you the creatures that lurk behind root, stone, mud and water. The beasts that soar through the skies. To take you on an adventure through these vasts lands as I'm discovering new faeries each and every day. Patreon is giving me the opportunity to explore and write new stories, experiment with new media and it allows me to give something back at the same time. Because this page is not about me. It's about YOU as a patron. I hope this page will give you an insight in what it takes to be a full time artist. I enjoy sharing, from the very first scribbles to the final piece. This page is a perfect way to show you how I create my art. By becoming a patron you'll get an exclusive look behind the scenes, you'll get to see what's on my drawing board before anyone else does. You'll be able to peek inside my sketchbooks. Read all about my favorite materials and my inspirations. And I'm here for you, to answer your questions, you can always reach out to me and drop me a message! It's almost like a secret club, we should figure out a special handshake! Patreon is a platform where people who like my art can support me, look at it as a tip jar. If you like what I do and would like me to continue sharing and telling you all about it, this is the best place to do so. In return for your 'patronage', you get exclusive access to sketches, behind the scenes, tutorials and so much more! If you are a first time Patron you can find answers to most of your questionshere FAQ. Becoming a Patron of the Arts is really simple and you can adjust your pledge whenever you want! The rewards aren't set in stone. Tiers can change, they might be edited to include other rewards or dropped entirely. If that's the case I will inform patrons well ahead of time. And if there's anything YOU want to see, just drop me a message. Thank you so much for supporting me, you can officially call yourself a Patron of the Arts! Acces to the Patron only Feed. This'll grant you access to all the sketches, work in progress shots and inner workings of my mind. Advance notice of new work and early acces to sales. A new desktop wallpaper to download every month. Thank you! You are a true friend of the Fae. Polls Help me to decide what's next by answering polls and telling me what you'd like to see me do next. On your first pledge at this level you will receive a personal message in the mail so don't forget to add your shipping address at checkout! Thank you! You're a fan of the Fae! You'll get the personal message on your first pledge by snail mail, videos, a look behind the scenes, acces to Patron only feed, advance notice on art and sales, and a new desktop wallpaper every month ! An ACEO (Art Cards, Editions, Originals) sketch, 2.5 x 3.5 inches every month of your pledge. You might even get the chance to request a specific subject once in a while. You truly love the Fae and the Fae love you! You'll get the personal message on your first pledge by snail mail, videos, a look behind the scenes, acces to Patron only feed, advance notice on art and sales and a desktop wallpaper every month ! An original postcard sized sketch EVERY month! Once in a while I'll ask you what you'd like me to draw! You are an inspiration and your support makes things happen! On your first pledge at this level you will receive a goodie-bag filled with some wonderful surprises! An original watercolor 6x6 inch sketch EVERY month! A unique chance to grab some original art at a Patron only price! Reaching this goal would be glorious! It means Patreon is allowing me to fully be an independent artist without the need of any client work. It means I can spend my time on creating more content for you, more tutorials and more art.